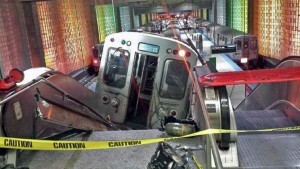 On March 24, 2014, a Chicago Transit Authority (CTA) passenger train overran the bumper at O’Hare subway station, injuring 34 people. The cause is under investigation. The front car of the eight-car train partially ascended an escalator. A spokesman stated that it was likely that the train entered the station at too high a speed. It was later estimated that the train entered the station at 25 to 26 miles per hour (40 to 42 km/h), which was not an excessive speed. Thirty-four people were injured. The front two cars of the train were damaged in the accident. Damage was estimated at $6,000,000. The National Transportation Safety Board (NTSB) has opened an investigation into the accident. Investigators are focusing on the theory that the motorwoman, 25-year-old Brittney Tysheka Haywood, fell asleep at the controls. She stated that she had recently performed “a lot of overtime”. When interviewed by the NTSB, she admitted falling asleep at the controls and disclosed that she had done a similar thing the previous month, which resulted in an overshoot at Belmont station on February 1. She did not reveal to CTA that she had fallen asleep when questioned about the overshoot. The investigation will be hampered by the train’s lack of a train event recorder, although it was fitted with a video camera. The recording from the camera is being examined. Images from 41 cameras within the station are also being studied. As a direct consequence of the accident, the CTA reduced the speed limit into O’Hare station from 25 miles per hour (40 km/h) to 15 miles per hour (24 km/h). The area of the speed limit was also extended away from the station.